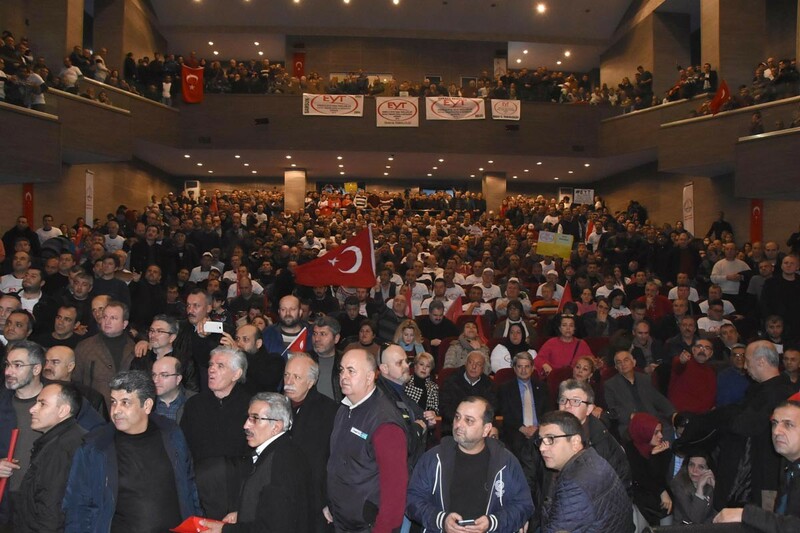 Hundreds of retirement age victims packed the Deniz Baykal Cultural Center in western city Izmir on Sunday as they protested against an age barrier to qualify as retired pensioners. The EYT, which can also be defined as the Retirement Age Barrier, has been an issue of much consternation over the years in Turkey. The unhappy workers have been paying the regular, required premium but now face the demise of not making the cut as qualifying pensioners. The meeting was organised by the Social Assistance and Solidarity Association of Those Who Exposed Retirement Age Barrier (EYTSYDD) and was attended by hundreds desperate retirement age victims, with other standing outside watching monitors that had been set up. This was in western Turkish province İzmir, some 471 km distance from Istanbul. Chanting of slogans like “Don’t sleep government, listen to our voices”, “we just wanted justice”, “EYT is here but where is Parliament”, could be heard reverberating across the venue. Some Soma coal miners wore helmets and carried placards reading “Our Soma, Our coal, Our halva, what will happen to us”, “the community which their labour is ignored”, “from Edirne to Kars, from Jupiter to Mars”. The Soma coal mine is near the town of Soma in the Manisa Province of Turkey. The mine has coal reserves amounting to 125.5 million. On 13 May 2014, an explosion at Eynez coal mine in Soma, Manisa, Turkey, caused an underground mine fire, which burned until 15 May, killed 301 miners. EYTSYDD general chairman Gönül Boran Özüpark said during a speech they carry the load of Turkey’s labour. “There are workers who have retired at the age of 38. This is not a claim but it is an indisputable reality. We saying that reinstating the previous law back will be righteous and equitable in terms of equality and logic,” said Özüpark. He said there are EYT victims whose acquired rights have been ignored for the cause of garnering votes by the government since 1999. “We are the ones whose savings were gasped in a different period while the taxes haven’t been taken from the riches. Our demand is not really to be paid peanuts, but to prove the rightfulness of our cause,” Özüpark said to an enthusiastic crowd. While describing their struggle as one for justice, deputy chairman of EYTSYDD Mustafa Avcı pointed out that the postponement of the retired age by the new law is a gross injustice. Those who have fulfilled the conditions of being 55 years old and having been insured for at least 5 000 days are entitled to a full pension in Turkey. This can be changed by the Social Security Authority.